Bosch offers a full line of windshield wiper blades engineered for extreme all-weather performance to ensure visibility no matter the weather condition. For over 75 years, motorists have relied on Bosch wiper blades for superior performance, quality and the latest in wiper blade technology. 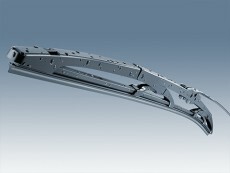 It’s Bosch’s knowledge of the complete Original Equipment wiping system that makes Bosch an expert in wiper performance. Conventional: Have a metal framework that holds the rubber in place. Beam blades from Bosch don't have any of the conventional joints and brackets. Instead, they feature a tailor-made high-tech single blade which adapts perfectly to the curvature of the windshield and distributes the contact pressure evenly.. Insight wiper blades from Bosch are used for all applications involving particularly tough conditions. This innovative hybrid blade has a a streamlined design that utilizes patented single beam technology to help provide a replacement for your vehicle's original equipment, hybrid windshield wiper blade. With the aid of the Quick-Clip universal adapter they are easy to fit on any vehicle and their advanced technology guarantees both optimum cleaning action and maximum safety. MicroEdge wiper blades from Bosch have a particularly good price/performance ratio. Their sturdy metal bracket system is extremely durable and robust, while the graphite-coated natural rubber wiper blade element ensures thorough wiping. Thanks to the pre-assembled universal adapter they can be quickly and easily replaced by our workshop experts – at an equally attractive price. All the various types of Bosch Rear wiper ensure optimum visibility and more safety when reversing. The flexible back of the blade element and the wear-resistant wiper blade edge guarantee outstanding, quiet operation and a long service life. 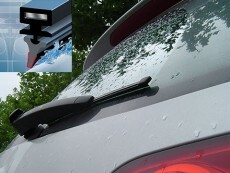 The Bosch Rear wiper range is available for almost all vehicle models. 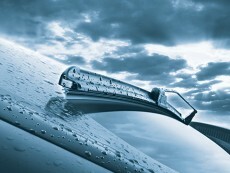 Most manufacturers recommend inspecting your wiper blades every six months for wear. The rubber component in a wiper blade deteriorates due to road debris, chemicals, and environmental factors like climate. Some types of blades last longer than others, but regular wiper blade replacement is an essential part of regular vehicle maintenance. Failures can be identified by excessive noise, streaking, large un-wiped areas of the windshield and chattering. If the rubber has started to tear apart from the blade it should be replaced immediately.